I had an idea for a dressing that spanned a lot influences. 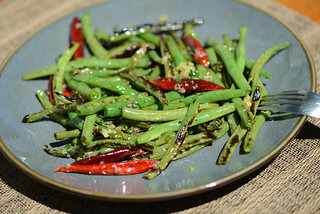 It started with tangy Greek yogurt, then brought in the ubiquitous mayonnaise, and next took a turn toward Asian cuisine with soy sauce, ginger, and garlic. There was also Dijon mustard and lemon tossed in there just to mix things up even more. I had a vision of what this would taste like, and once I put the dressing together, it didn't quite match up with totally cohesive and super savory picture I had in my head, but I decided it was tasty enough wanted to see how it would work in the final dish. I've only made smashed potatoes once before, but they were a hit, so I'm not sure why I haven't made them again. These are small spuds that are boiled until tender, then lightly smashed, and, finally, grilled. 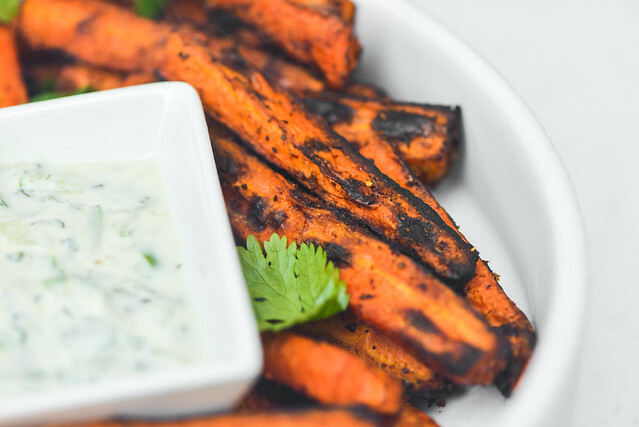 The end result is a unique combination of textures and flavors that make them more delicious than your average grilled tuber. The smashing part can be a little tricky though. If you smash too much, the potatoes just fall apart, so a gentle smash just to break the skin is really all you're after. Even with treating each potato with the same care, I still had a bunch that crushed into multiple pieces, but that didn't bother me much for this recipe because everything would be mixed up into a salad, and who would even notice a fully intact spud over a broken one anyway? After done smashing, I placed all the potatoes in a large bowl and tossed them with olive and seasoned lightly with salt and pepper—don't forget the dressing is seasoned as well, so no need to overdo it here. Because the potatoes were already cooked, the grill was used as a way to alter the texture and flavor. 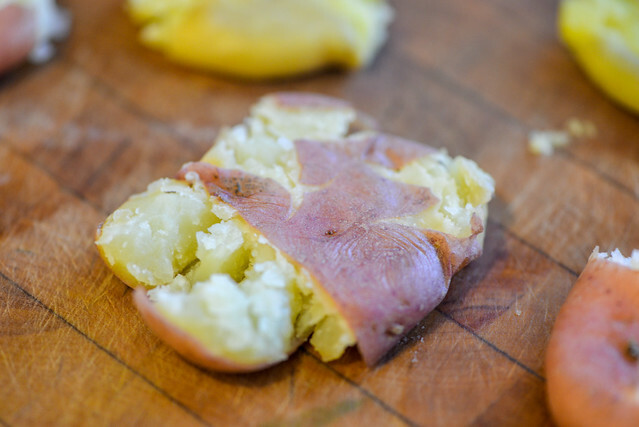 My goal was to get good browning on these smashed spuds, which would add in crispy bits as well as some of the smoky and lightly charred taste you get from using a live fire. I used a fresh, blazing hot fire to cook these potatoes, so it only took about three minutes or so per side to get them to their fully grilled state. At which time, I moved them to a large bowl, poured in the dressing, and tossed to combine. Next, I transferred the dressed potatoes to a large platter and added on the fresh components, which were a hearty amount of scallions and watercress. When I tried the dressing by itself, I had some reservations about the recipe I was building, but once everything was altogether, it tasted amazing. 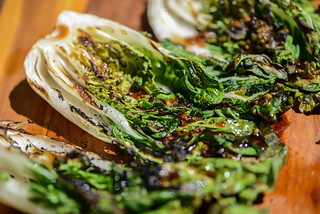 The dressing had a nice tanginess and savoriness to it, and the garlic and ginger I thought wasn't fitting in when tasting the dressing alone, melded very well once assembled, adding a mellow bite that gave the salad extra depth. Beyond the excellent textures that were happening with the smashed potatoes, I think what really tied everything together were the scallions and watercress, adding the right complimentary oniony and fresh components to make the entire salad taste whole. 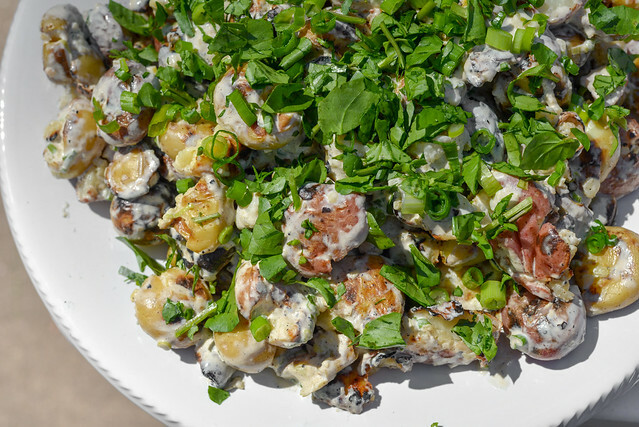 Because this potato salad wasn't rooted in any one cuisine, I think it also made it the perfect side dish for a day where we had mains course that spanned everywhere from China to Serbia to America! 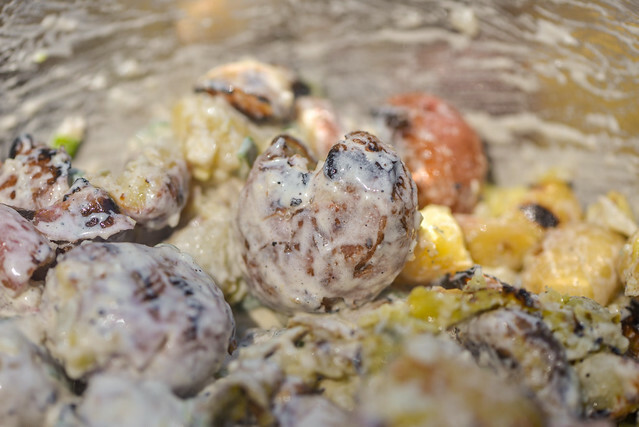 Boiling, smashing, and the grilling potatoes gives them unique and excellent textures and flavors to make this a one-of-a-kind potato salad. 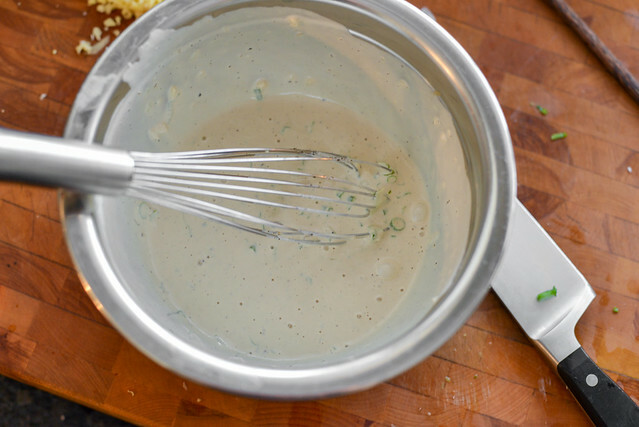 To make the dressing: In a medium bowl, whisk together yogurt, mayonnaise, rice vinegar, mustard, lemon juice, soy sauce, ginger, and garlic. Season with salt and pepper to taste. Transfer dressing to an airtight container and store in refrigerator until ready to use. Scrub potatoes and place in a dutch oven or large pot. 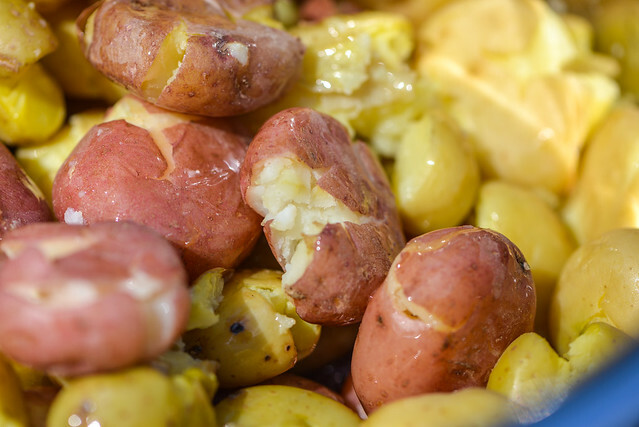 Add cold water to completely cover potatoes. Bring water to a boil over medium-high heat, add 1 tablespoon kosher salt then reduce heat to a simmer. Cook potatoes until a paring knife can be slide into center of potatoes with no resistance, about 20 minutes. Strain potatoes and let sit until cool enough to handle. Gently smash each potato with the palm of your hand until split open, but not breaking apart. 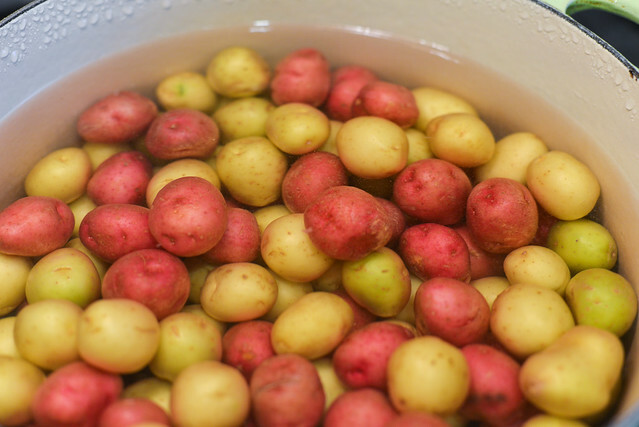 Transfer potatoes to a large bowl, add in oil and season with salt and pepper to taste. Toss to coat. Light one chimney full of charcoal. When all the charcoal is lit and covered with gray ash, pour out and spread the coals evenly over entire surface of coal grate. Set cooking grate in place, cover gill and allow to preheat for 5 minutes. Clean and oil the grilling grate. 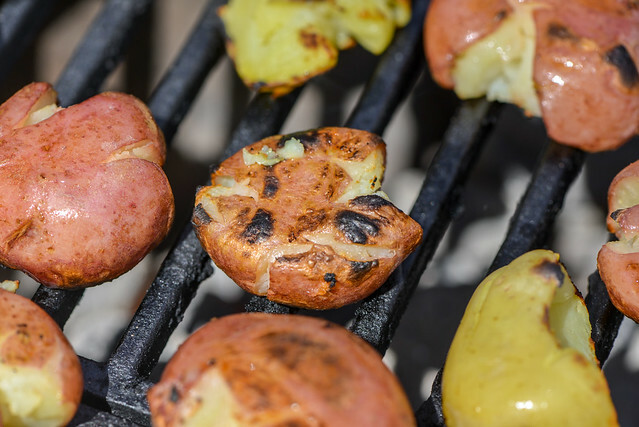 Place potatoes on grill and cook until lightly browned and crisped, 3-5 minutes per side. Place potatoes back in large bowl, add in dressing, and toss to coat. 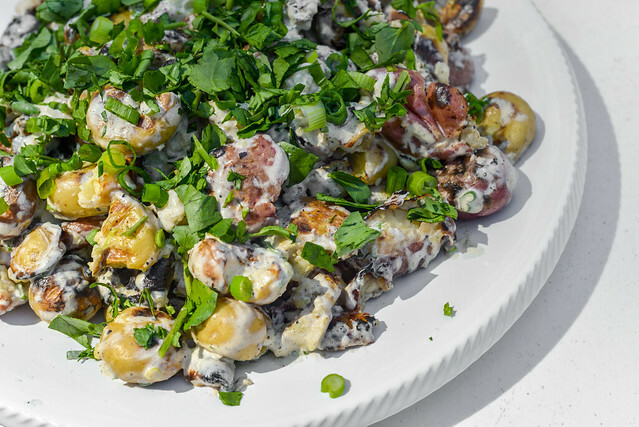 Transfer potatoes to a large serving platter and garnish generously with scallions and watercress. Serve immediately. This is an excellent recipe. Thanks for sharing!